Invite your friends to your game room and introduce the Worthington Foosball Table by Tornado. This football table blends right in with your home furnishings with a black and soft maple, two-tone design. The patented game parts and the unique crosshatch foot design of the miniature football players offer precise ball control and active gameplay. Moreover, new 3-piece split bearing helps rods move smoothly. The Tornado table surely will stand in long-lasting games with its adjustable commercial-grade leg levelers, natural wood handles, and down corner construction along with a thin-wall bearing for improved passing and blocking shots. Other features of this game room table include dual side ball returns and it even comes with urethane textured foosballs. Bond with your family and friends by playing on this cool football table now. Buy from Dazadi and get free shipping! 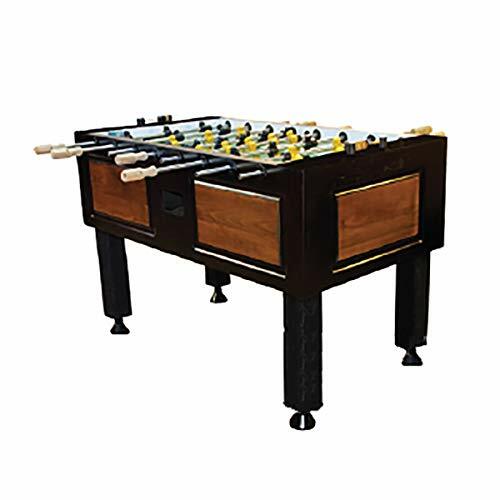 Buy Tornado Worthington Foosball Table at Discounted Prices ✓ FREE DELIVERY possible on eligible purchases. STYLISH DESIGN WITH A CLASSIC TOUCH - This football game table has a two-tone black and soft maple design which showcases its classic look and blends with your home furnishings. The 1.5-inch thick medium density fiberboard cabinet completes the awesome design. Assembled Dimensions: 56 L x 30 W x 36 H inches / Weight: 350 pounds. SOLID CONSTRUCTION - The 0.75-inch foosball playing field features an amazing graphics which helps enhance your shot accuracy for intense play. Plus, it includes a patented urethane textured foosballs for perfect roll. This table is equipped with adjustable commercial-grade leg levelers, and down corner construction for durability and toughness along with a thin-wall bearing design for improved passing and blocking shots. FEATURES UNIQUE FOOSBALL MEN - The patented Tornado men features a new cross hatch foot design that offers precise ball control and active gameplay. For professional gaming quality, it is also designed with a three-man goalie with smooth playing surface and dual side ball return. SLEEK AND DURABLE HANDLES - Made with natural wood, the solid football handles is equipped with heavy-duty steel rods with hollow center in order to make them lighter and faster. Also, it features a new split bearings which help the rods move smoothly. WARRANTY AND FREE SHIPPING - Enjoy a 1-year manufacturers warranty and free shipping as well when you purchase this game on Dazadi.